Memebership special here at Blues for Food ONLY!! $5.00 Tim Hortons gift card with each $25.00 membership purchased. Various great local musicians (about 13) volunteer their musical prowess to help raise non perishable goods and cash for our local Sault Ste. Marie Soup Kitchen, see poster below for Friday's lineup. 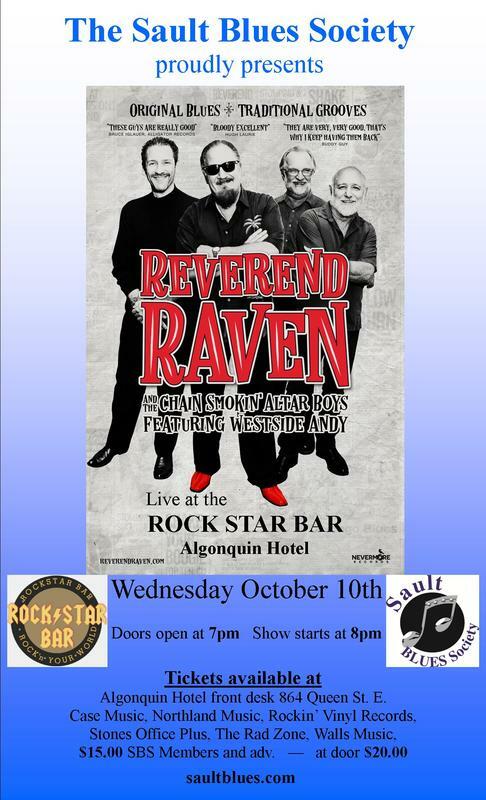 ​Sault Blues Society memberships available also. Various great local musicians (about14) volunteer their musical prowess to help raise non perishable goods and cash for our local Sault Ste. Marie Soup Kitchen, see poster below for Saturday's lineup. Thursday May 10th 6:00 pm Verdi Hall - MONKEYJUNK takes to the stage at 8:00pm. 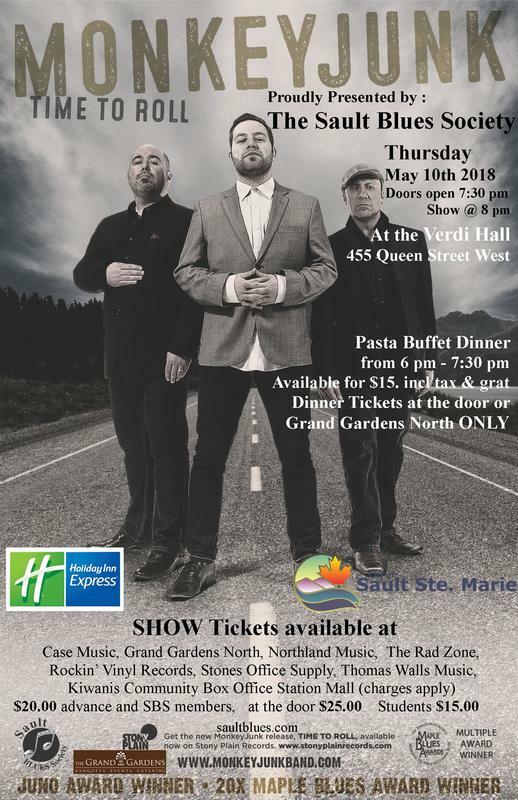 The Sault Blues Society (SBS) is very pleased to host the 2018 JUNO award winning blues band MonkeyJunk at the Bridgeview Verdi Hall on Thursday May 10th 2018 at 8pm. Optional pasta buffet for an extra $15 at the door starting at 6 pm. The Verdi Hall is located at 455 Queen Street W. under the International Bridge. MONKEYJUNK TICKET OUTLETS ARE NOW CLOSED. SOLD OUT! We scrounged up 10 extra tickets which will be available only at the door so if you still need a ticket get there early to buy at the door. Only 10 available!! Doors open at 6pm for the optional pasta buffet that'll run til 7:30 for an extra $15. Advanced and SBS member tickets are $20.00, student tickets are $15.00 and tickets at the door will be $25.00. This SBS show is a licensed ALL ages event. The dance floor will be open. There is also a pasta buffet dinner available (from 6:00 - 7:30 pm) by purchasing $15.00 dinner tickets at the door. ​Doors open at 6pm with the show to start at 8pm. ​See poster at the top of this page. saultonline.com: "Exclusive one on one with Steve Marriner from MonkeyJunk"
The Sault Blues Society partnered with the Bon Soo Winter Carnival for the very first time to proudly bring Harpdog Brown & his Travelin’ Blues Band to the Machine Shop along with the locally well-loved Jay Scali Band. Harpdog Brown, Canada’s harmonica player of the year 3 time winner, put on a first class performance in front of the huge crowd at this all-ages licensed Bon Soo event. On stage with Harpdog was Sky Lambourne (slide trombone) and Graham Guest (keyboard) and locals Mark Gough (drums), Joel Poluck (guitar). The opening act - the Jay Scali Band was a definite crowd pleaser and consisted of Jay Scali (vocals, guitar), Lynne Reville (keyboard, sax and vocals), Brien Proulx (drums), Bob Yeomans (guitar) and Warren Reville (bass). On the following day Harpdog conducted a workshop for harmonica players open to the general public for beginners to advanced at Thomas Walls School of Music. 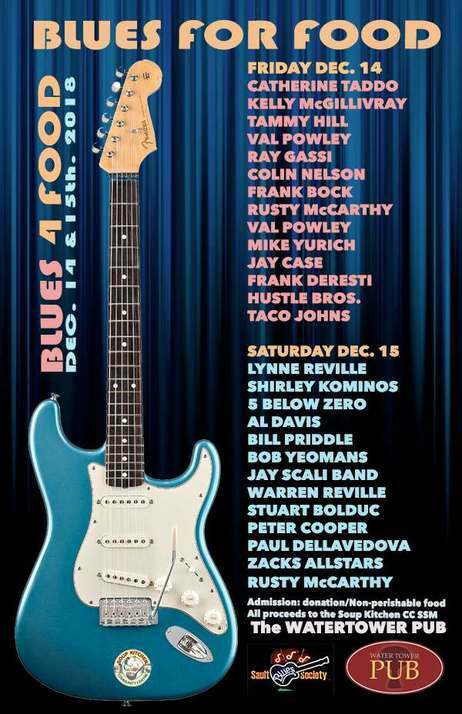 ​Rusty McCarthy once again put together another great line-up of musicians to entertain the full house at this year's anniversary celebration of Wednesday Night Blues at The Pub. saultstar.com: "McCarthy finds his place with blues nights"